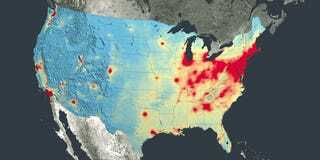 You can literally breathe easier now; new imagery from NASA's Aura satellite shows that over the past 10 years, air quality in the U.S. has improved. It's not to say that the environment isn't still generally screwed, but that's great news, especially if you live in or near a city. Nitrogen dioxide is one of the six common pollutants regulated by the U.S. Environmental Protection Agency (EPA) to protect human health. Alone it can impact the respiratory system, but it also contributes to the formation of other pollutants including ground-level ozone and particulates, which also carry adverse health effects. The gas is produced primarily during the combustion of gasoline in vehicle engines and coal in power plants. It's also a good proxy for the presence of air pollution in general.